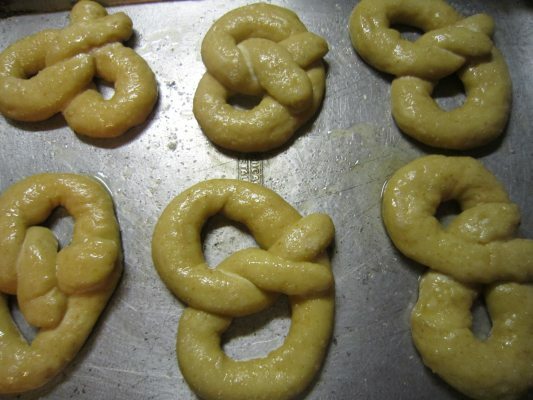 Soft Pretzels are fun to make. You get to be a kid again, rolling dough, forming shapes and having a good time. 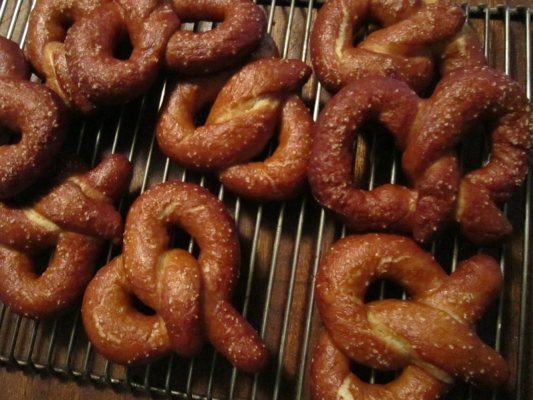 Sourdough Pretzels are fabulous the day they are made, but because of the nature of sourdough and salt, they quickly become tough and soggy. So plan on eating and sharing them the first day and if you have some leftover, don’t store them in a plastic bag, but a paper sack. This will make about 4 lbs/1845g of dough at 60% hydration. This is not a wet dough. I made 21 pretzels at 3 oz each. So if you do not want to make that many pretzels, half the recipe amounts. This year, I have been working on my new book, “100% Sourdough.” It will be all about sourdough using 100% hydration starter and will use a dough trough for mixing the dough. My book, “Discovering Sourdough,” utilizes 166% hydration starter and uses a dough mixer. So the recipes you will be seeing on my blog will be using the 100% hydration starter and a mixing bowl or trough for mixing your dough. Mix all of the ingredients starting at the top of the ingredient list and working your way down. Add the flour last. Then get your hands in there and stir the ingredients together well until you form a sticky dough. I substituted 4 oz of a whole wheat starter in place of 4 oz of the white stater to obtain a more rustic flavor. This is called morphing(I made that up!). You will find morphing in my downloadable book as well. When you substitute part of the starter using a whole wheat starter or a rye starter, you can introduce some extra rustic flavor. Since the starter has already fermented the whole grains, the phytates, which can make grains harder to digest, have started to break down. You also introduce more enzyme activity for color and sweetness. Using a rye starter can make the dough stickier. 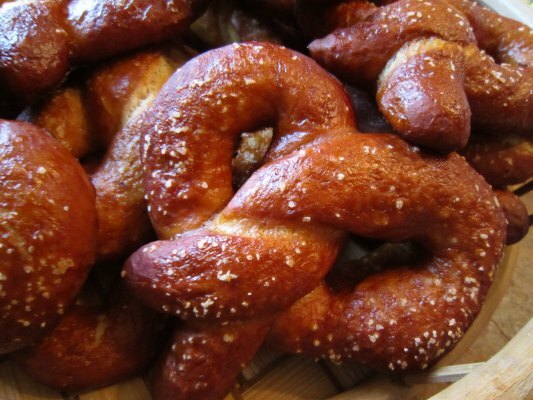 So, anyway to get on with soft pretzels…. The dough is now made and needs to be fermented. 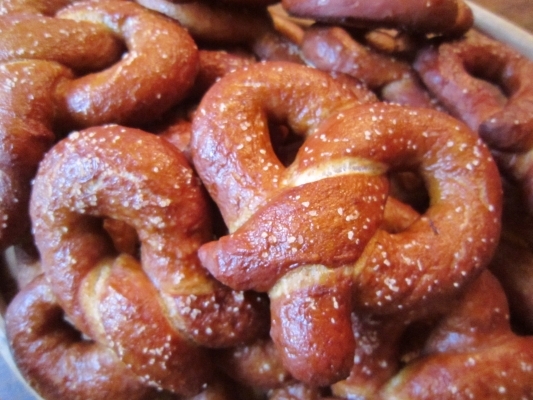 You can do these pretzels two ways. 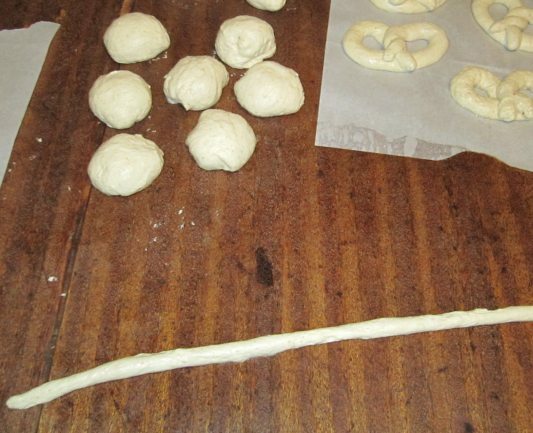 Start early in the morning and make a one day dough, baking the pretzels the same day, or make up your dough and then refrigerate overnight, baking them the next day. Done the same day, the pretzels are somewhat softer and not as tough later on when they age. Done the next day, they have more flavor. So decide which you prefer, or try both ways and see what you prefer. If you intend to refrigerate your dough, start your dough later in the day and ferment for 3 to 4 hours, folding the dough twice during the ferment time. Then place the dough in the refrigerator overnight. Next morning allow the dough to warm up for two hours before shaping. If you wish to do a one day dough and bake, start your dough early in the morning and ferment for 5 – 6 hours (fold the dough 3 – 4 times during ferment), shaping and baking them in the afternoon. 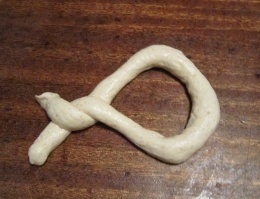 For a traditional shape, shape the dough like the first picture above, and then flip it over onto the rounded side. You can shape them however you like and have fun twisting them into wierd shapes if you like, especially if you have children helping you. 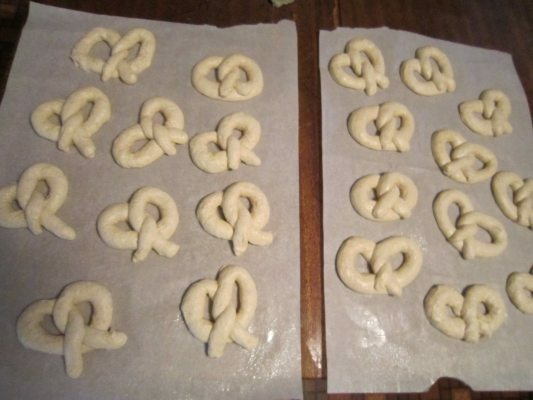 Then place your pretzels onto an oiled parchment paper or pan to proof. I proofed the pretzels for 2 hours. When ready, turn your oven on to 425 degrees and preheat. Then get a large pan or large skillet and bring 2 quarts of water to a simmering boil. Add 5 oz of baking soda and 0. 6 oz of salt (about one tablespoon) to the boiling water and step back because the water will foam up when you do so. Next, I added three pretzels at a time to the simmering hot soda/salt water and allowed them to boil gently for one 30 seconds on each side. Then using a slotted spatula, take out the pretzels and arrange them on an oiled pan. 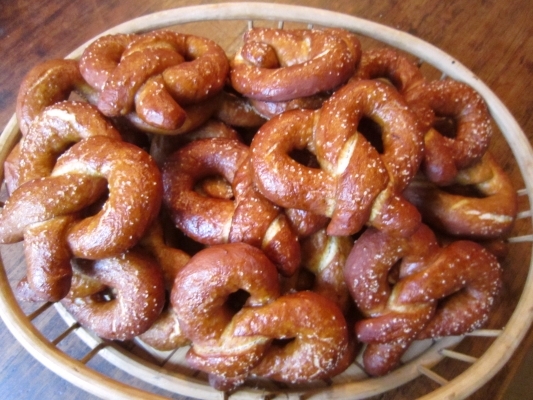 When your pan is filled with pretzels, make a mixture of one egg and one tablespoon of water (beat together well) and using a pastry brush spread the egg mixture over the top of each pretzel, then sprinkle with a coarse baking salt. I only had flaked salt and it worked good, but tended to dissolve into the egg mixture. You can take some rock salt and pound it until it is the size you would like(sift it as well). You can also try Margarita salt. Bake the pretzels until they are a nice dark brown color which should take about 20 minutes. Take them off the pan immediately or they will try to stick. Enjoy them with cream cheese, butter, sharp cheese or fancy mustard. We also slice the pretzels in half and stuff them full of lunchmeat and cheeses. I know Jeremy Shapiro doesn’t like mustard on his pretzels… but I do! 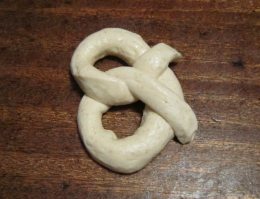 He had a great post on making pretzels earlier in the year, on his informative blog, Stir the Pots. Try the pretzels, your family will be very impressed! By the way, my website is now completely new as is my blog. I did a redirect to my new blog (this blog you are reading)from my old blog, but the redirect will expire. So update your bookmarks. And if you have linked to my blog from your blog or site, please update your link as well. This post will be submitted to Susan’s wonderful blog Wild Yeast/Yeastspotting.